The House Veterans Affairs Committee will hold a hearing today on ending homelessness for our veterans. The hearing comes at a critical time, as large numbers of veterans are returning from Iraq and Afghanistan in need of services such as housing, mental health counseling, and job placement. National community-based homeless veteran service provider organizations, already stressed by the large number of homeless veterans from the Vietnam War, Operation Desert Storm, and other military conflicts, have expressed concern about the inevitable increases in Iraq and Afghanistan veterans who will require their services in the future. Even though it can take years after leaving military service for veterans’ problems to push them into the streets, some aid workers say the Iraq and Afghanistan veterans are appearing on the streets sooner than Vietnam veterans did. Special traits of the current wars may contribute to homelessness, including high rates of post-traumatic stress disorder, and traumatic brain injury, which can cause unstable behavior and substance abuse. Furthermore, the long and repeated tours of duty for soldiers can make the reintegration into family life and work much more difficult. 154,000: Number of veterans—male and female—who are homeless on any given night, according to the Department of Veterans Affairs, in 2008. Perhaps twice as many experience homelessness at some point during the course of a year. 26 percent: Fraction of the adult homeless population who are veterans. Veterans make up only 11 percent of the civilian population 18 years and older. 33 percent: Percentage of veterans who are chronically homeless. 335,000: Number of veterans who were homeless over the course of 2006. More than 400: Number of Iraq and Afghanistan veterans who have been identified as homeless through entry into VA-supported residential programs across the country. 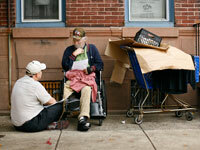 1,500: Number of veterans from the Iraq and Afghanistan wars the VA has identified as high risk for becoming homeless. 11 percent: Number of homeless veterans from the Iraq and Afghanistan wars who are women. Roughly 40 percent of the hundreds of homeless female veterans of recent wars have said they were sexually assaulted while serving. 45 percent: Percentage of homeless veterans who suffer from mental illness. 70 percent: Percentage of homeless veterans who suffer from alcohol or drug abuse problems. Mental illness and substance abuse problems overlap considerably. 56 percent: Percentage of homeless veterans who are African American or Hispanic. To help homeless veterans and prevent returning veterans from becoming homeless, the House Committee should look at expanding employment assistance, substantially increasing transitional housing beds and supportive housing, increasing veterans transition and work training programs, improving access to excess federal property such as clothing, and promoting cooperation between federal, state, and local government agencies and community-based veteran service organizations that have demonstrated success in working with homeless veterans. Veterans who are able to access support on the federal or community level and find employment are more likely to stay off the streets and make the transition back into civilian life.